Collar/Tags: Red Harness with Ottawa tags. Is Microchipped. 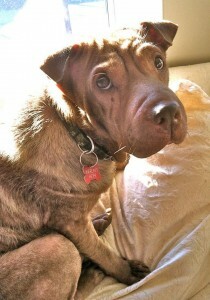 Additional Notes: LOST DOG: Cole Harbour/Delta – Driftwood area/Halifax County FEMALE: Shar Pei, 4 years old, wearing a red harness, with an Ottawa tag, micro chipped. NAME: Ariel She went missing May 7/13. She is shy of strangers and will not approach. She is a rescue and is also ‘from away’. I cannot express enough my appreciation for everyone’s help in the rescue of Arielle. This little one is a gift from heaven and to have her back is beyond words.